This piece is titled Teomama, which in Nahuatl means “God Carrier” it was the name given to our medicine men and women who carried the bones of Huitzilopochtli from Aztlan to Tenochtitlan, present day Mexico City. A few of you might recognize this composition, it is the image on the Mexican flag, an image of a prophecy. The Teomamas carried the medicine bundles for 200 years down into Anahuac valley waiting for a sign and it was when they reached lake Texcoco they finally saw it. An eagle eating a snake on a prickly pear cactus, a union of sky and earth, so they knew it was safe to build their city here. And so they did, on the lake. 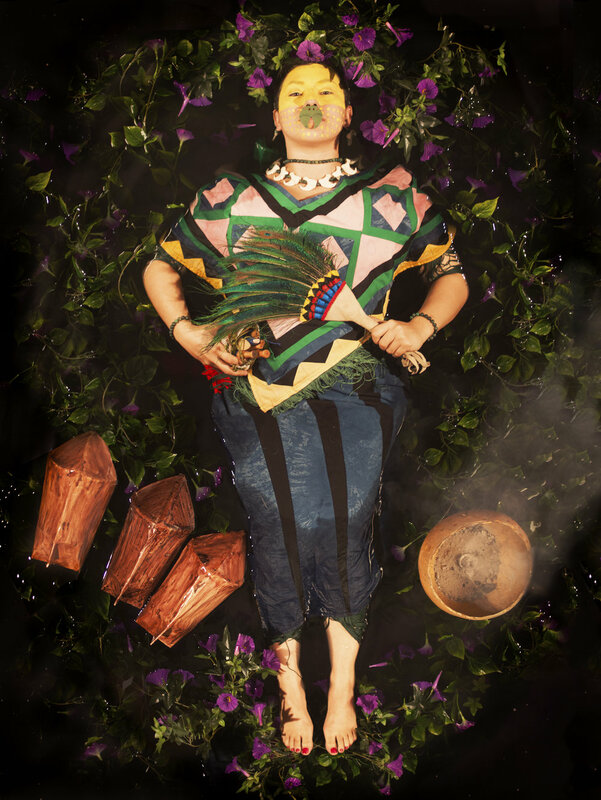 In this piece I act as the Teomama, carrying the female hawk on my back and I am Tenochtitlan, the land, my garment and hair disappear into the water and the light reflected on it. Melissa K. Nelson, an Anishinaabe cultural ecologist talks about the Native Woman’s body that in so many stories acts as a kind of meeting place, a contact zone, between the human and more-than-human life which establishes an ethic of kinship between my body, the water and the sky. My ancestors long understood the abject was a tool for accessing the sublime. In this piece Im the Cuauhxicalli, the offering stone, the one who holds the heart cut from the sacrificed. This is a hawk, eating a quail and it is a blood transfusion to the cosmos. This is not the nature we want to see. But the earth is hungry.